Whilst it hasn’t snowed where I live YET, it has been exceptionally cold and when it gets chilly, I head to the tub. There’s just something about a nice hot bath that not only makes me feel ready for bed but it makes me feel super cosy and warm too. My bath product of choice for the last month has been the Argan+ Indulge and Relax Foam Bath which is quite a new release, having only launched this winter but I’ve been using it since the beginning of December and thoroughly enjoyed it, in fact, I’ve nearly used all of it up (I’m dreading my gas bill coming through as we have a huge bath that takes A LOT of water to fill!). This isn’t the first product I’ve used from Argan+. My favourite product of theirs is the Dry Body Oil as it smells incredible and makes my skin feel super lovely. I posted a review here that I really recommend you check out if you’re looking for a multi purpose oil that you can apply direct to your skin or into your bathtub for great results. As with all of the Argan+ products, the foam bath is enriched with give precious oils, these being Moroccan Argan oil, Baobab oil, Kukui oil, Moringa oil and Sacha Inci, making it a really luxurious addition to my bathwater. The five oils all have different properties but what they do have in common is that they all have nourishing and restorative elements that can benefit the skin. 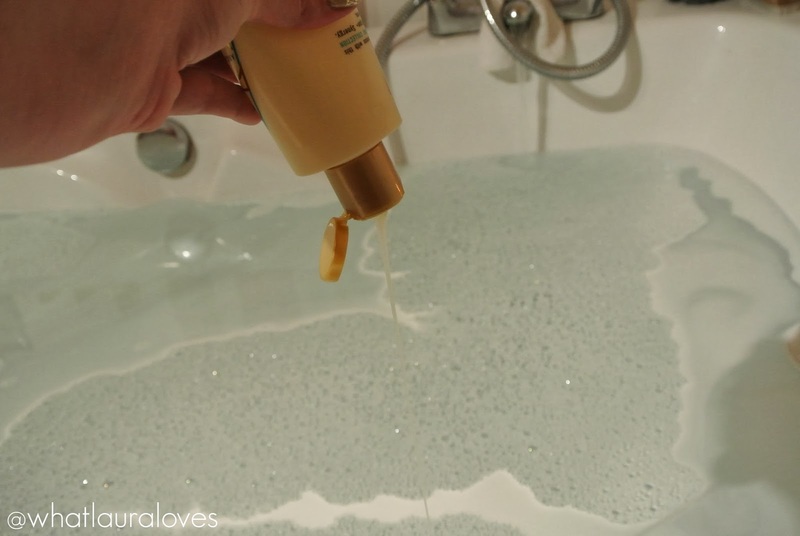 I simply give the bottle a generous squeeze under the running hot tap of my bath and swirl it around before leaving the bath to continue filling up. Once full, I jump in (well perhaps not jump), lie back and relax. The bathwater smells incredible, although not as strong as when the Dry Body Oil is used in the bath so if you found that one too strong, this would be a more delicate option for you to try. This is very much a bath foam and you aren’t going to get lots of bubbles out of it like a bubble bath but that’s not what its about. This product is all about enriching your bathwater to make it a really nourishing treat for your skin and to make you feel calm and peaceful which it certainly does, especially when you light a couple of candles around the bath too. I tend to opt for non scented candles so that I can smell the scent of the bathwater. When I get out of the bath, I pat myself dry and I can really feel that my skin is more moisturised than when I first got into the bath. There are lots of fatty acids in each of the five oils that this foam bath contains, with Baobab Oil being the most enriched with them, and they offer high levels of Vitamin A and F which really help to hydrate the skin, giving it that moisturised feeling. As well as that, there’s the Sacha Inci which is rich in Omega 3 and 6 which helps to lock in moisture on the skin, giving it a softness that really lasts which is perfect for winter days when you’ve been out in the cold. Mr WLL and I went to a Christingle service at our church over Christmas and it was sooooo cold that when I got home I just had to jump in the bath to warm up. I hate that dry, tight feeling that the cold gives my skin and having a bath with this foam really helped to turn that around! Protecting your skin is really important during the winter time too as it is much easier and less timely to make your skin soft and moisturised in the first place than it is to pull it back around after it has taken a hit with the cold- as they always say, prevention is better than cure. The Moringa Oil that is in this foam bath contains over 46 antioxidants that help to guard against premature ageing and the Argan Oil is rich in Vitamin A to help protect the skin’s oil barrier so it helps to keep the moisture in rather than letting it out and therefore, it protects your skin. The Kukui Seed Oil is a new one for me and an oil that I have only found in this line of products… unless I’ve had my eyes shut for the last three years I’ve been blogging. It’s a fab ingredient as it contains linoleic and liniolenic acids that stimulate skin cells to help reduce scarring and help to prevent stretch marks. Unfortunately I have quite a lot of the latter and I don’t want anymore thank you very much so I am all for a bit of Kukui Seed Oil! In addition to the natural vitamins, fatty acids and omega oils that the Argan+ synergy boasts, it also has wheat protein in it to replenish the skin to leave it feeling soft and smooth. I find that the softening properties of this bath foam are felt the most when I give my skin a good scrub first to slough away all of the dead skin cells. The one that I’m using at the moment is from Victoria’s Secret and it’s in the fragrance Such A Flirt. 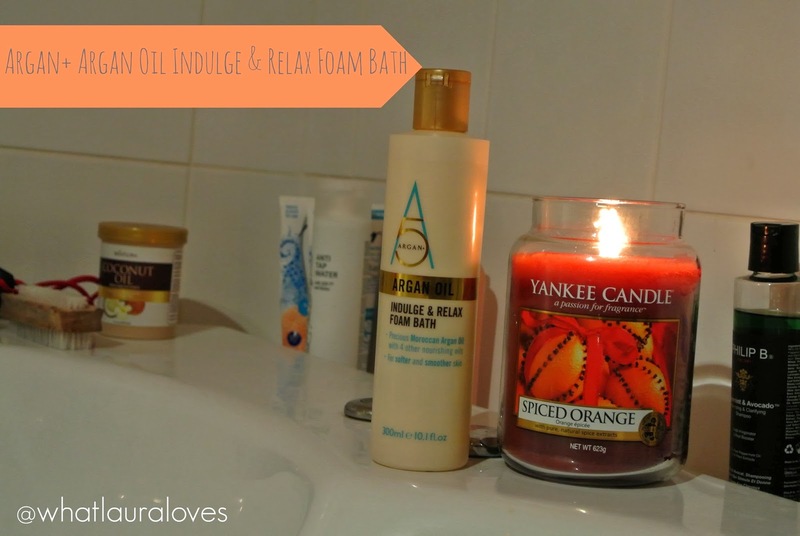 The Argan+ Indulge and Relax Bath Foam is available exclusively at Waitrose online here and from Feel Unique here. 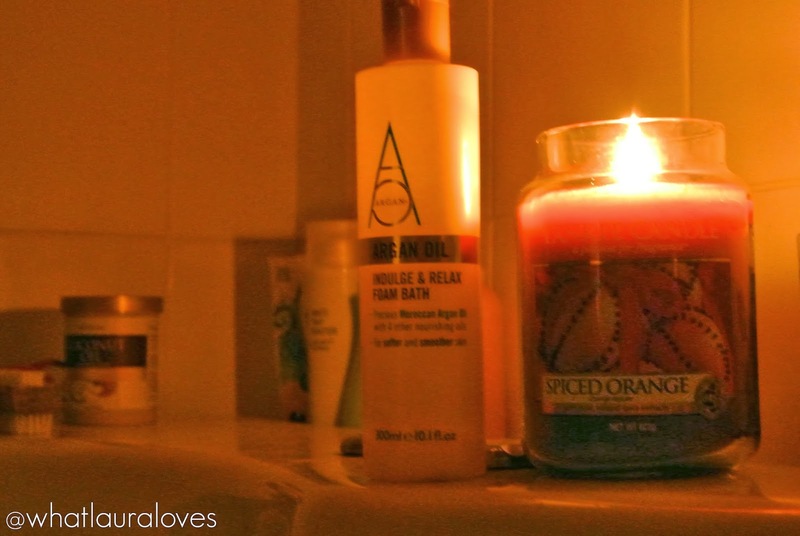 What is your bath time indulgence this month? Oh my, your bath is amazing!! I'd be in there for hours!